I bought this watch a long while back.. about 17-18 months ago. It was a bit of a punt, as it had a few issues. 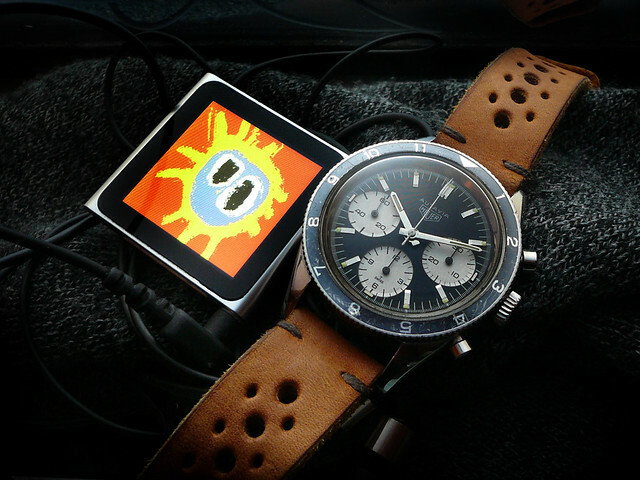 It had an incorrect crystal, handset from a Heuer Calculator and odd looking lume. Apart from that, the case was untouched being nice and sharp, plus the bracelet looked good. 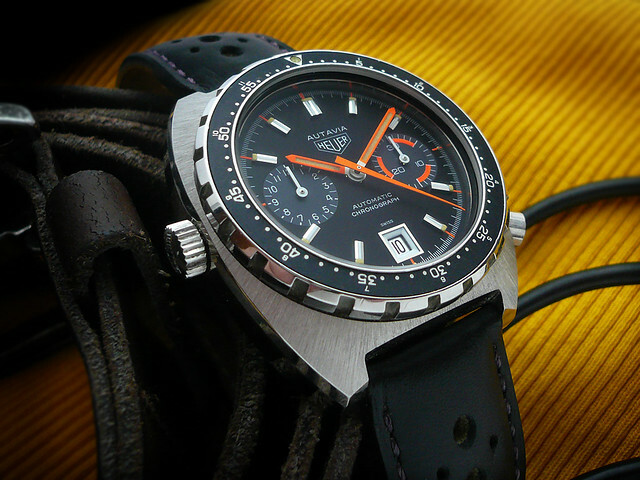 This example has the ‘fat boy’ case, like that on the 1163 ‘Orange Boy’ and Siffert, the case is stamped 1563.. some were stamped 1163. 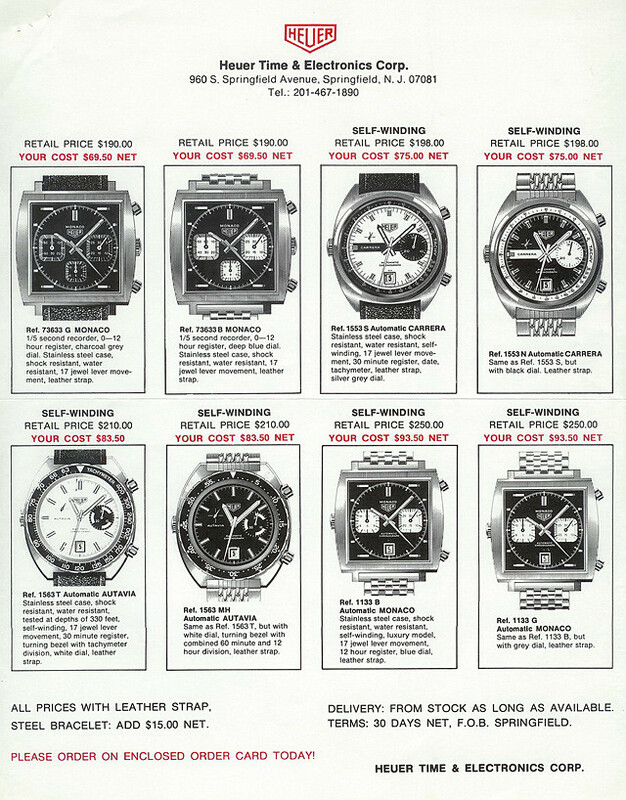 Both black and silver dial versions are seen here in the 1972 Caliber 15 brochure on OTD. 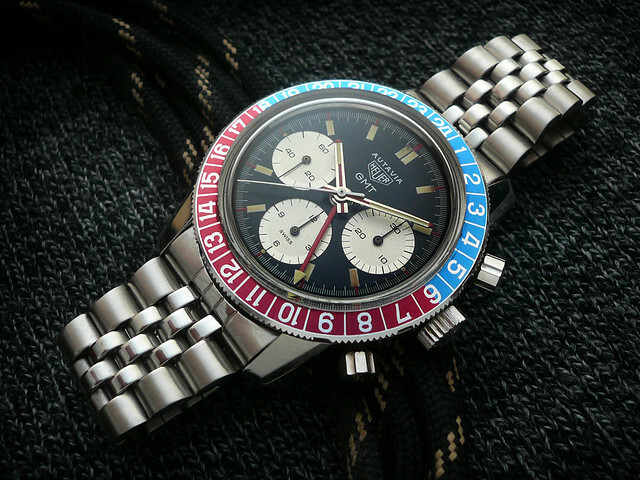 The cosmetic issues bothered me, the dial/hands/lume/mint insert looked disjointed. A bit like having a lovely old Sub with faded insert, beautiful brown aged lume on the dial, but with brand new white hands.. it’s not a BIG deal, but it just looks wrong... same with this watch. The handset was like new, bright orange, although from a Calculator (with a paddle central sweep chrono hand), the lume on the dial was greeny.. maybe a relume, with a mint insert. Non of these elements sat well with the lovely sunbleached dial. 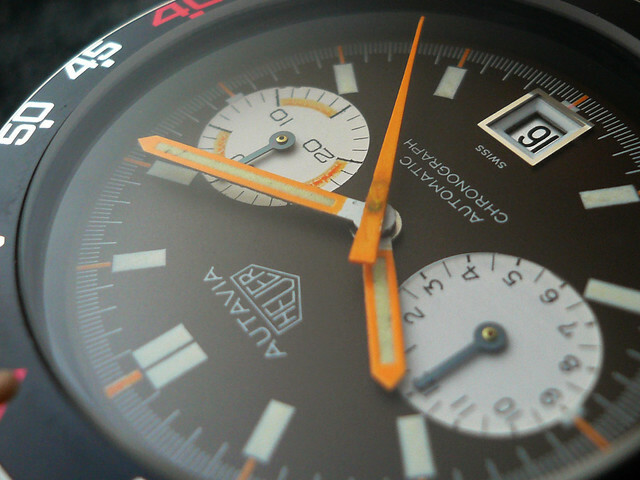 The orange accents on the sub-dial had faded gracefully to a yellowy hue , the minute track fading to almost white. Eventually a white Autavia handset was tried.. and it did look much better, and had an almost ‘Super KonTiki’ vibe about it. The lume was next to get treatment. I had considered having it scraped out of the tramline hour batons, but this could be a messy/risky job, so decided to try to tint the existing lume. 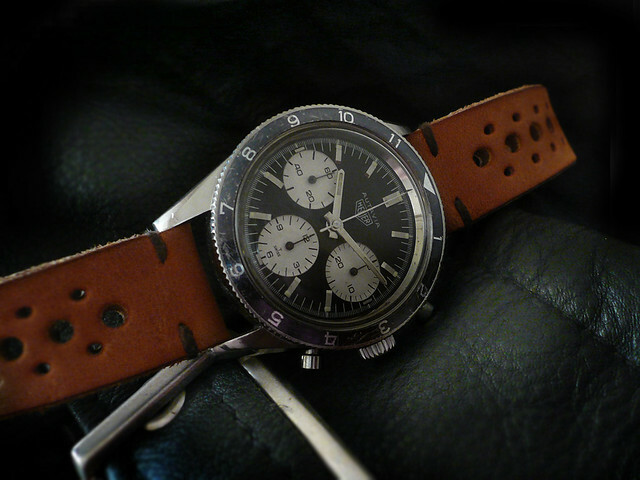 I aimed for a traditional honey/coffee/tobacco colour, to complement the faded sub-dial. Armed with a 0000 sized brush, and a steady hand.. several applications of tint resulted in a surprisingly fantastic finish to the lume.. beautifully textured and mottled in just the right ‘honey tobacco brown’. 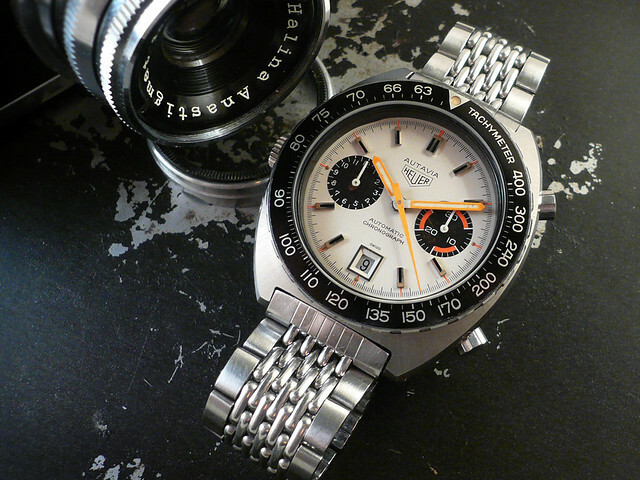 In the meantime, I had been fortunate enough to win a NOS Autavia crystal on ebay. Finally the watch was sent off to have the hands relumed. Jimbo did a fantastic job, the texture was bang on the money.. but to make it have the perfect match to the dial, I tinted the hand lume just a touch with the same method as I did the dial. The bezel insert was looking ‘too new’, being factory gloss black, so to bring it in line with the rest of the watch, I bleached it. It was a leap of faith, as I wasn’t sure what would happen. The silver of the lettering was dulled right down.. almost to matt white, but still with a hint of silver, more importantly, the gloss black had turned a really nice matt finish. I’m now blown away by it.. the sum of the tweaked parts all come together to create something much more ‘whole’ and together. I know some may turn their nose up at it for having been artificially tinted lume, dulled down insert and an incorrect white handset, but I feel that the watch works much better in this state. For me, it’s a case of – it works better than if it was trying to be ‘factory’ correct. Plus, I’ve seen a few 1563’s over the years with heavily faded handsets and dials. Oddly, I have seen these with white hands before – sometimes called ‘Albino’, due to the loss of the colour accents. 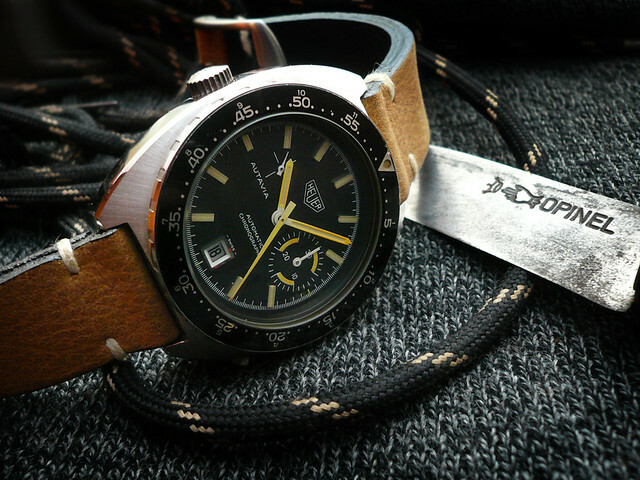 Just to finish it off perfectly, I made a distressed strap to match the lume.. and it really is a nice package now.. although, I have to admit, it looks wonderful on the signed Heuer ‘Japan’ market Beads of Rice bracelet. This whole process has made me realise that it is the very subtle aged accents that make a vintage watch so wonderful.. and without these ‘aged’ hints on all components, it looks wrong. I bought this wonderful watch back in July, and I can’t believe it’s taken so long to get it on the blog. I may as well get it out of the way now.. 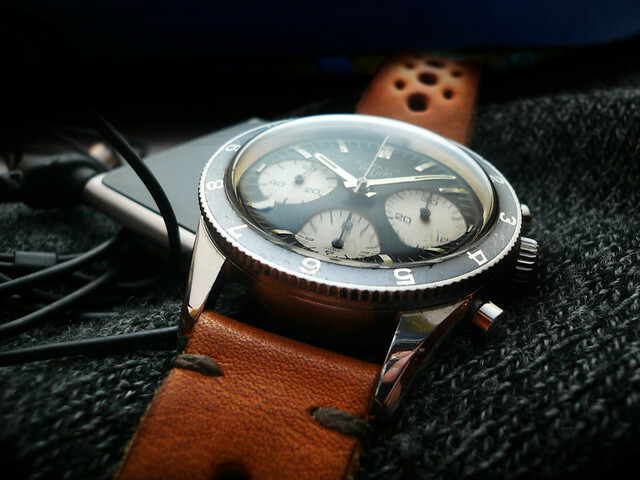 I think this is my favourite watch – in fact, I think it’s one of the best looking vintage watches out there. I know that might raise a few eyebrows, but it’s only my humble opinion.. but I really do think it’s perfect for me. 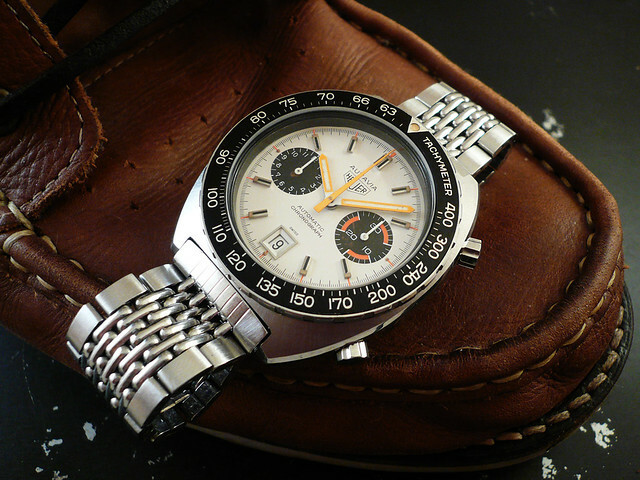 I do have a soft spot for the Valjoux 72 Heuers, having 3 others, but this one is definitely my favourite. 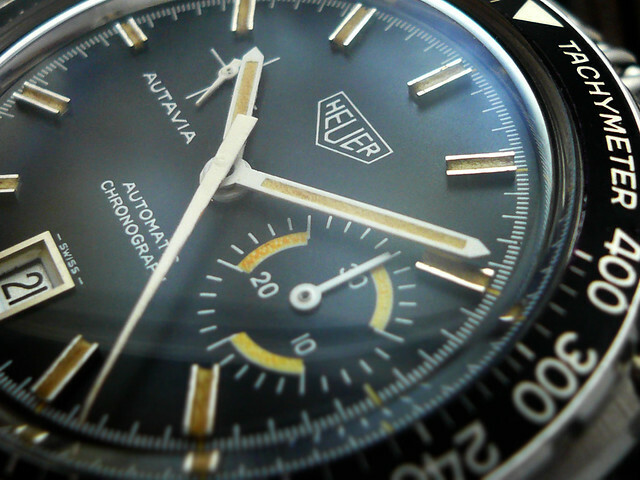 I think it’s the simple monotone design coupled with that perfect coffee coloured lume. 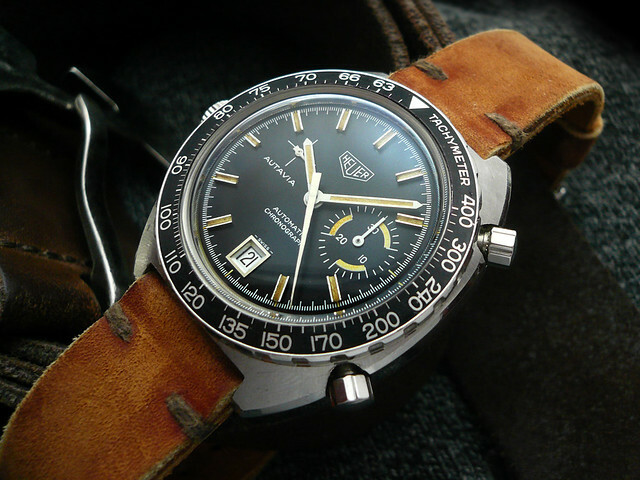 It came my way through a ‘want to buy’ request on the OTD Heuer forum, and fellow Heuerista, Jamey came up trumps with this cracker. 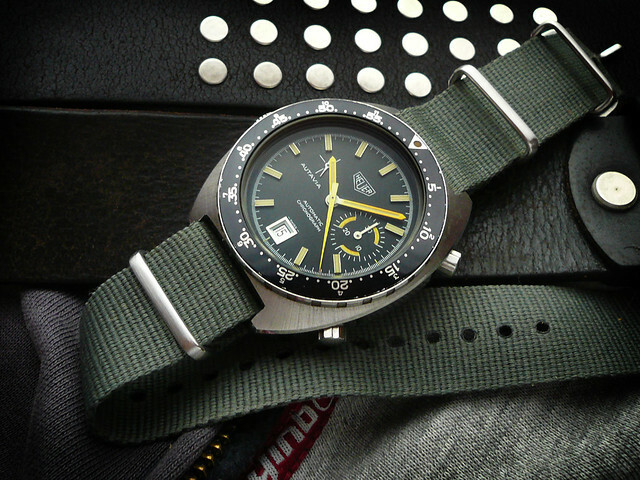 It did originally arrive with a rather battered min/hour bezel… but I happened to have a NOS Tachy bezel in the back of the drawer, and it transformed the look spectacularly. The watch has seen some life, not being a safe queen.. the case having slight battle scars, but it is nice and sharp and unpolished. I actually like it all the more for the ‘non-mintness’, as I don’t pamper it, it has become almost a daily wearer. 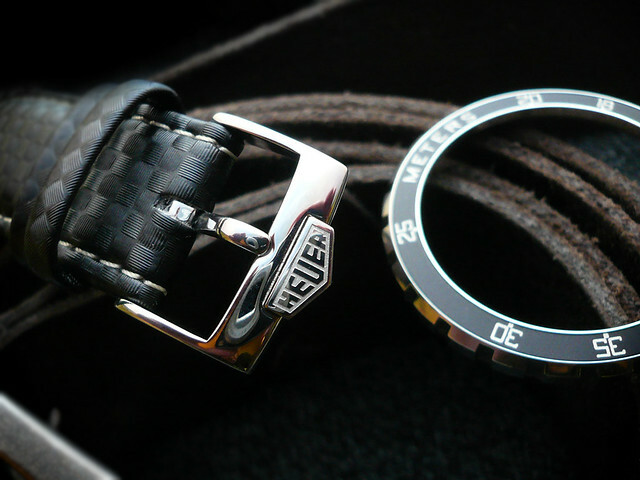 In fact, I enjoy it so much, it has made me realise that I have far too many watches that I rarely wear. 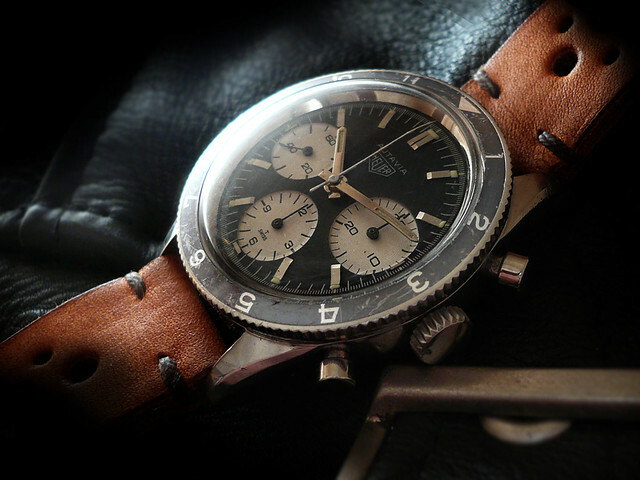 So, it’s a circa 1968-9 compressor case model, and fairly large for a watch from that era, being 41mm without the crown. 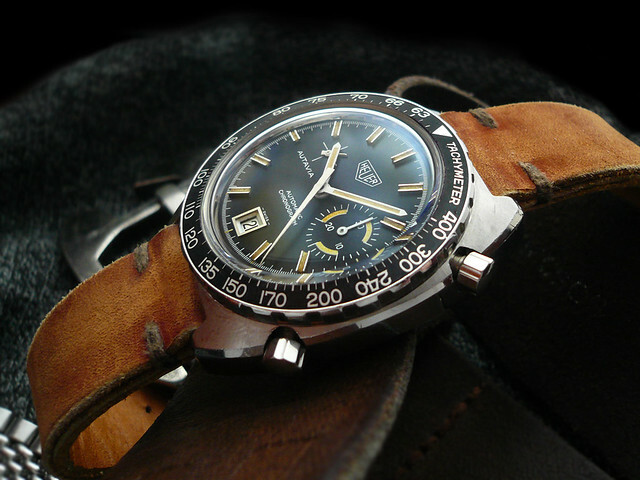 Although this is an earlier 2446C model, this is a later version of this particular mk/generation, having a plain caseback and fluted pushers. The model that came after it featured red highlights and different hands/hour batons.. see it here. The correct metal bracelet for it is a Gay Frères (GF) beads of rice, but they are hard to find and cost a small fortune. 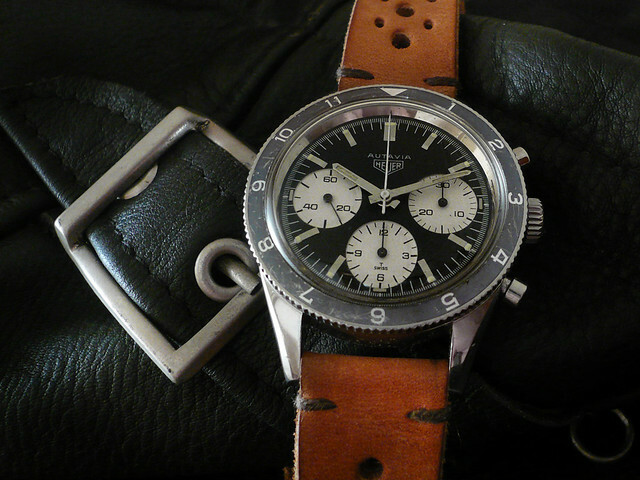 I had this old jubilee bracelet in my box of straps, which suits it nicely – but this watch is perfectly at home on a NATO, dress leather or vintage style rally. Recently discovered photos show James Hunt wearing a Compression cased Autavia, most probably a 2446. 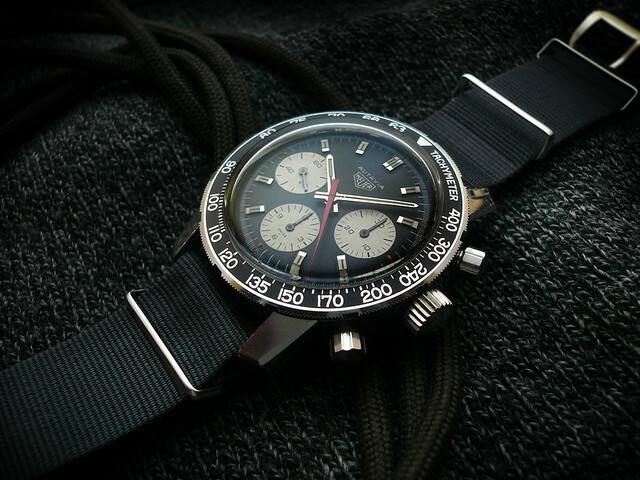 It seems he was a bit of a Heuer fan, with other photos showing him wearing a panda dial Carrera 2447NS, many years after it was released (on both a GF and rally strap), and possibly wearing a gold Carrera 1158. 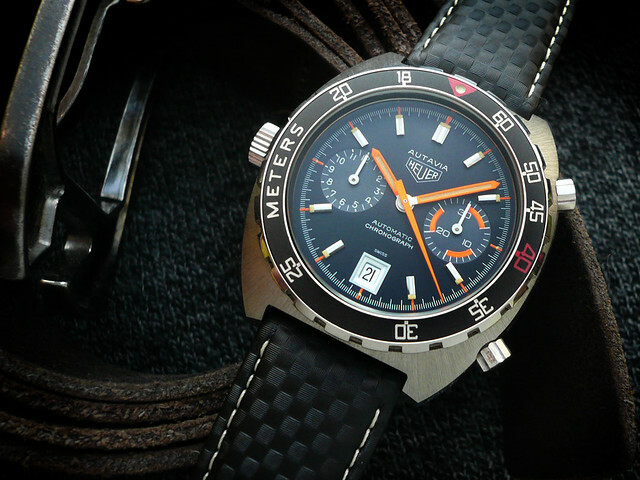 Like most Heuer collectors, I have a thing for any of the GMT’s, and while most are popular amongst the Heueristas, it’s the 2446 examples that seem to be highly appreciated by the wider watch world. 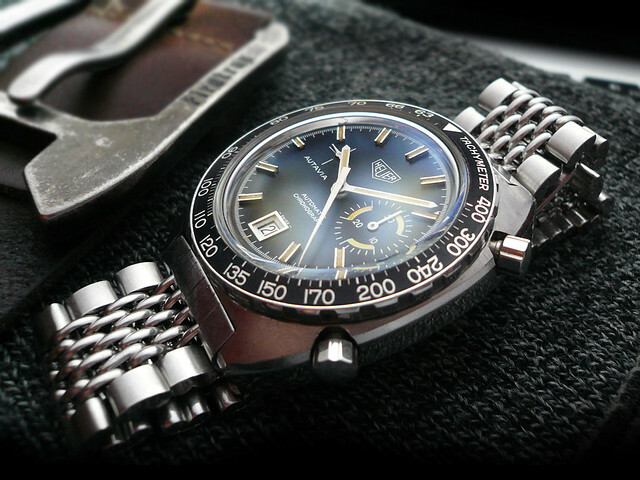 Maybe it’s the classic styling and the Valjoux 72 based movement (v724), either way it’s a prized watch. 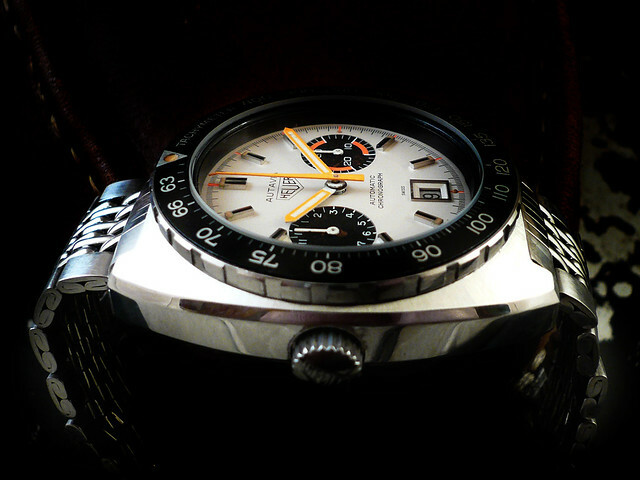 I did have a 2446C GMT already, albeit with a very faded bezel, and I was in the process of contemplating having the bezel milled out and an aftermarket insert fitted (the bezels on these are one piece, you can’t just replace the insert – it’s printed directly on a solid bezel). Then, this beautiful example came along. 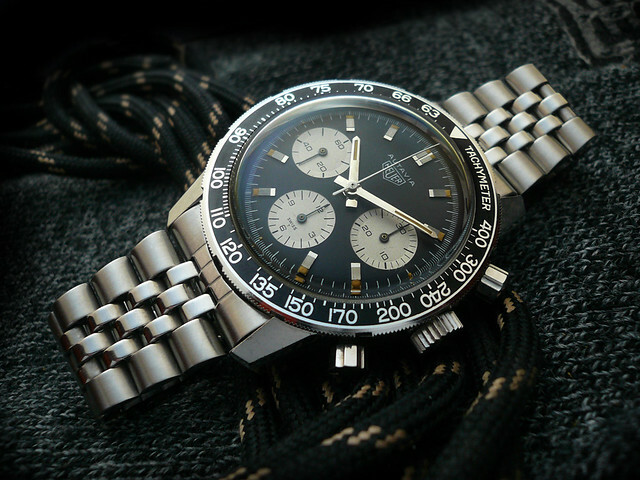 It was a little serendipitous, as the seller – a fellow collector in the US saw my ‘Mitsukoshi’ panda dial Speedmaster conversion, and we chatted via email as he wanted to do the very same mod. 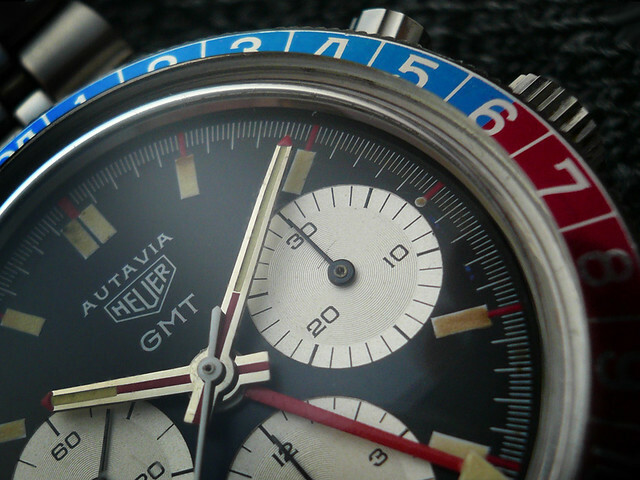 Which he eventually did, and was so pleased with the outcome, he listed this stunning GMT on the Heuer forum. I spotted it and fired an email, and it was mine.. thanks Jim, I owe you a beer! 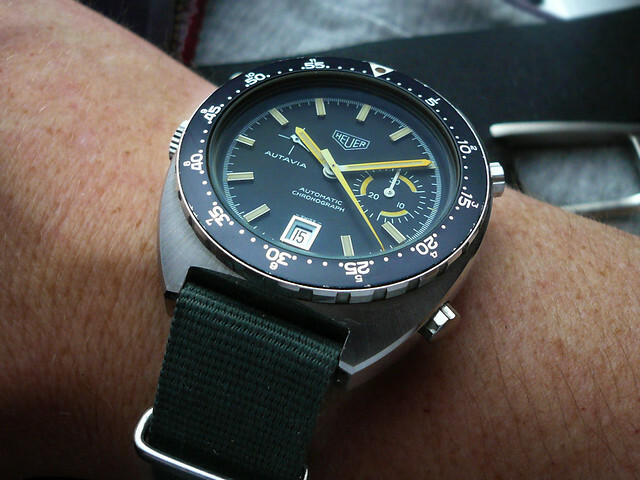 So, what can I say about this lovely thing – well, it’s a 2446C Mk4, the last GMT in the 2446C case, and it’s a marvel, in amazing condition having spent many years in California, them onto Jim in Indiana, then onto me. 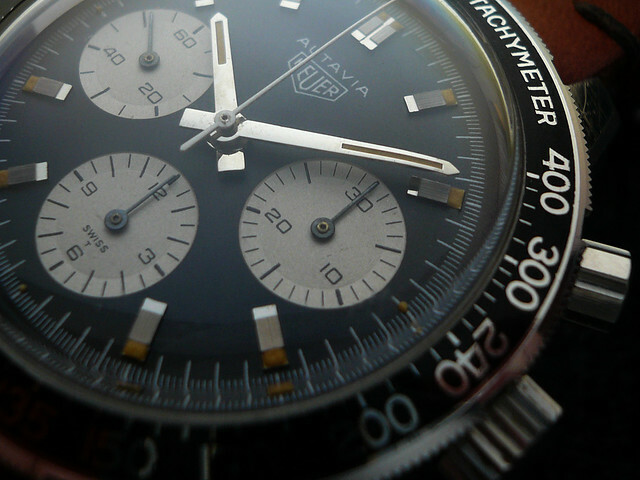 Together with it’s younger son, the 11063 GMT – last of the Autavia GMTs. 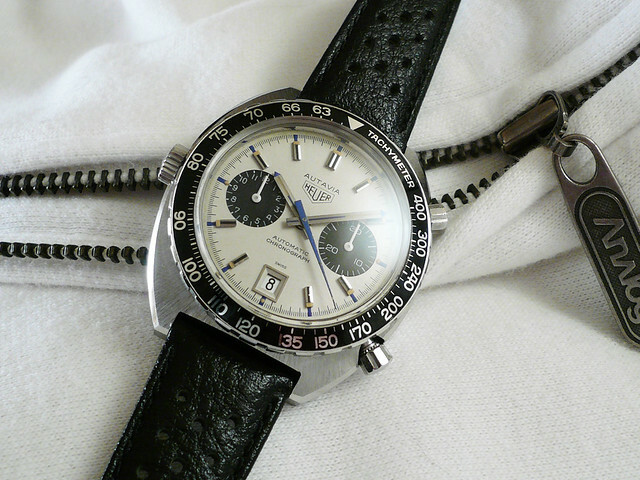 Common knowledge would say this has a white central chrono hand from an earlier model – (which is something I’m pleased about, I think it looks much better with a white hand, usually seen on the 2446 screwback, I don’t know why Heuer changed to red!). The odd thing is, I did some digging around some of the old catalogues to see if indeed it should have a red hand, and I can’t be absolutely sure it should actually be red. I found some back and white line drawings in some of the catalogues, and it looks white – but this just might be artistic license in the line drawings. 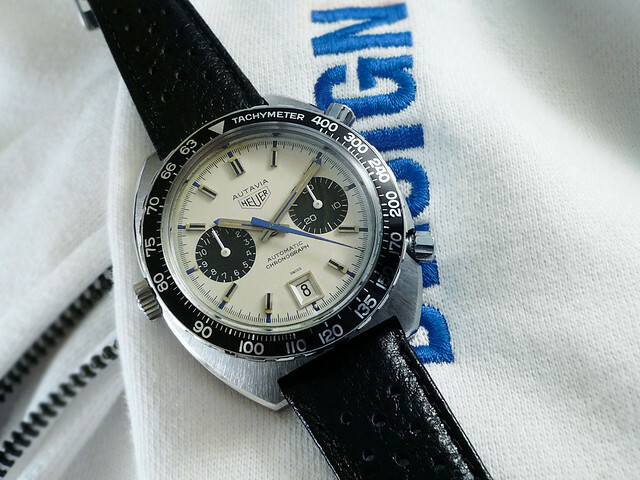 Also, in the history section of the TAG Heuer website, they have a photo of this same model with a white hand, also with a rather fetching lime green/yellow GMT hand. This is of interest, as the later GMTs hand this greeny/yellow hand, so maybe it is a transitional ‘last in production’ model. 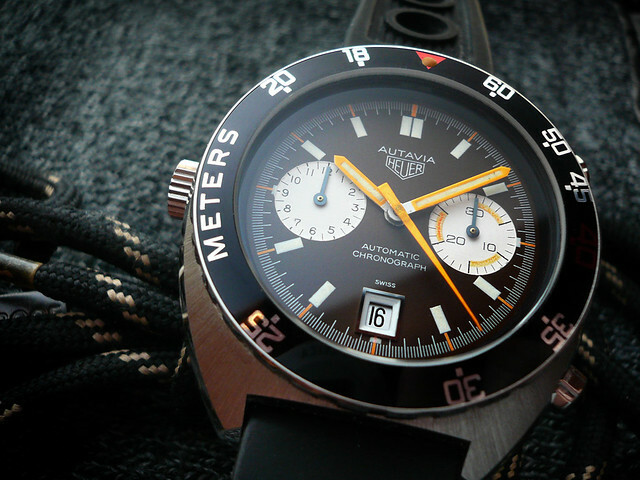 Note that TAG Heuer have stated ’69, but that is for the 2446 model range, not that specific watch. Either way, I prefer the white hand, and if I ever spot a greeny/yellow GMT hand, I’ll bag that too! 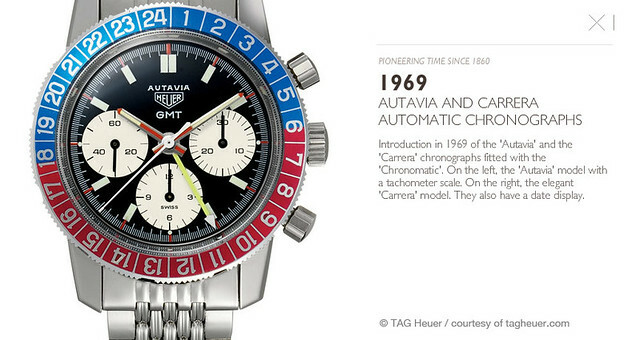 The GMT is also seen in one of the catalogues (with red chrono hand!) 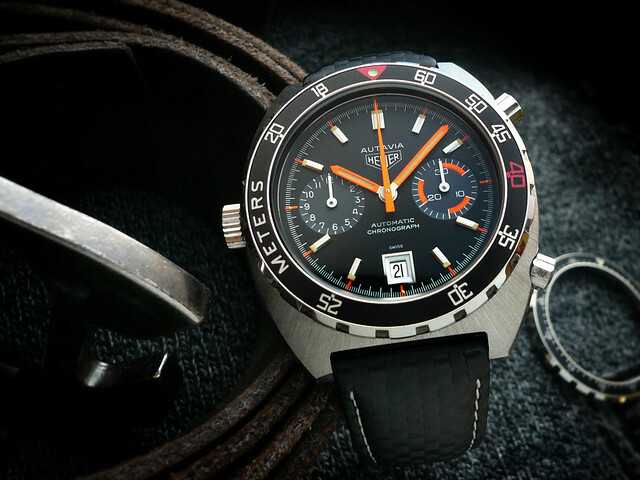 pictured with a GMT Super Autavia dash timer, and the Red Arrows, stating “Used by the RAF Red Arrows in the London to Sydney Air race. I’ve hunted around for info on this air race, with not much luck. 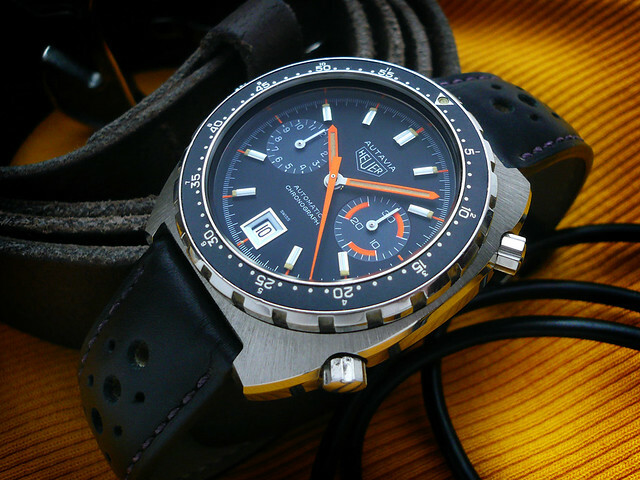 I’m aware that many Heuer collectors may be shaking their heads or simply thinking ‘why?’.. why take a perfectly good and original 11630 orange/black and convert it.. some may label my creation a ‘franken’, and let’s be perfectly clear here – technically, yes – it is a franken. Allow me to explain.. 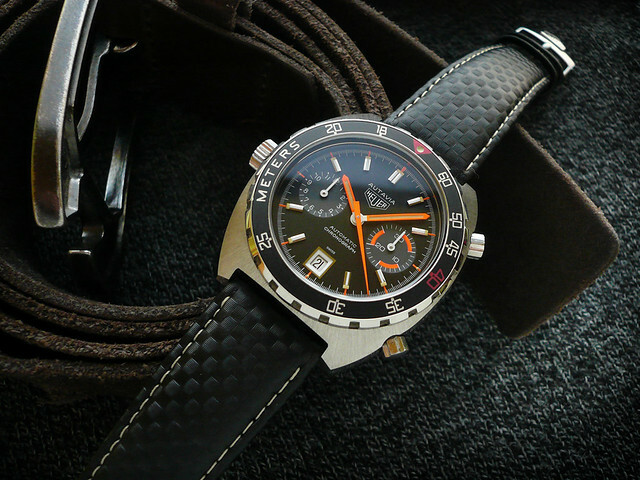 The early 70’s 11630 orange/black was one of the first serious Heuer chronos I bought.. a long time ago. My budget was limited, and it was a bit rough around the edges.. still, I was very proud of my new watch. I had it for some considerable time, then eventually sent it off to Jimbo, my go-to watch man, to fit a new crystal.. and I remember him emailing me back, with some photos – saying that the dial and hands were in remarkable condition.. 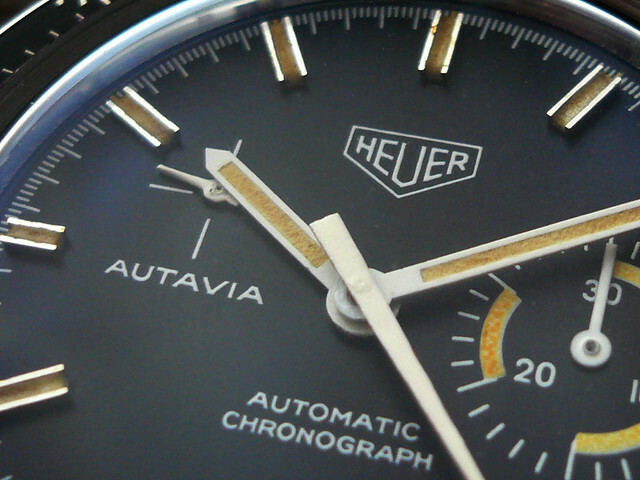 I was so surprised.. as the heavily scratched crystal didn’t really allow a good view of the dial. It turned out to be a great stroke of luck, the dial and handset was, well.. quite simply, the best I or James had seen. 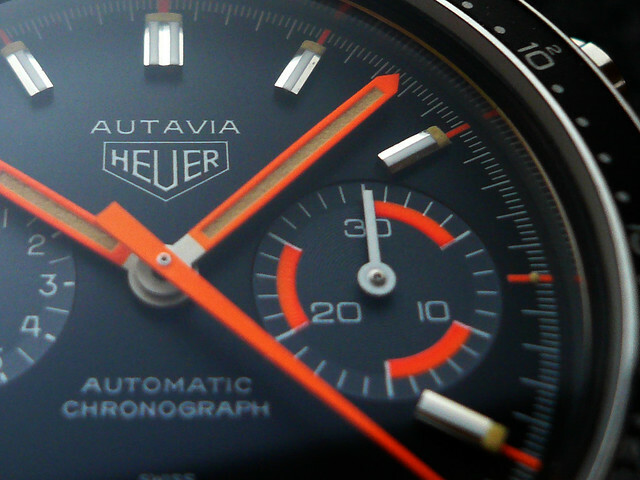 Deep orange accents with sublime original lume.. all factory fresh, the dial perfect in every way. Result! Thing is.. I rarely wore the watch.. it didn’t feel right, it didn’t sit well on my wrist. This I can’t explain.. I’m a big fan of the 11630 case, and have several , I wear them all with no problem at all. But this one, just didn’t feel right.. weird. I’m fully aware that there are minor case differences across the 11630 range, there were two case suppliers, and I’m guessing that the shape may have differed over the years, but we are talking about miniscule difference. So, as it wasn’t getting any wrist time, I decided to sell it… Then, in a mad moment I thought “why not try it in a 11063 case”, and the seed was planted. It appealed to me, because I love the big ol’ 11063 case, I think it’s may favourite. I guess it was a case of ‘sell the watch or try a different case’. 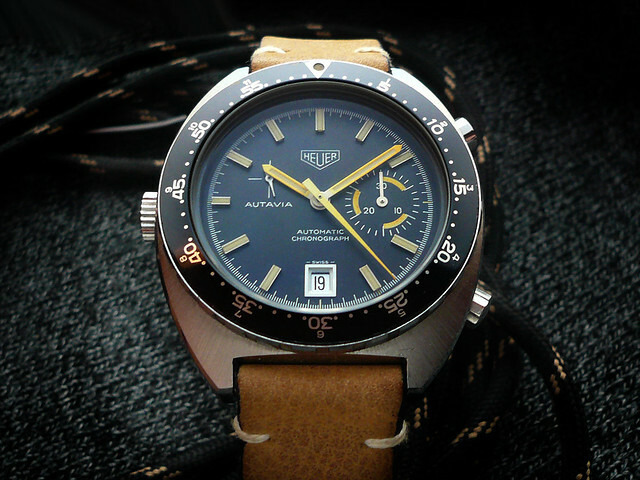 At this time I was reminded of Abel’s stunning custom PVD Heuer – the ‘Abeltavia’, it was a brave move, but had a great reception amongst the Heuer fans.. as he wasn’t hiding it’s ‘franken-ness’.. it was an open an honest custom – and it looked great. Time passed, and the project was put on the back burner, while I seeked out a 11063 case. Eventually one popped up, from a fellow US Heuerista, and I traded a bracelet for it. The case was a little worse for wear, but no major dings. I sent it off to the Belgium master, Abel, who did superb job refinishing the case., and I don’t say it lightly – it’s one of his best.. it’s so sharp it’s just wonderful to study. So, with the case sorted it was good to go to Jimbo, who expertly put it all together with a new crystal and a black glass gasket – every detail ticked. The results are amazing. 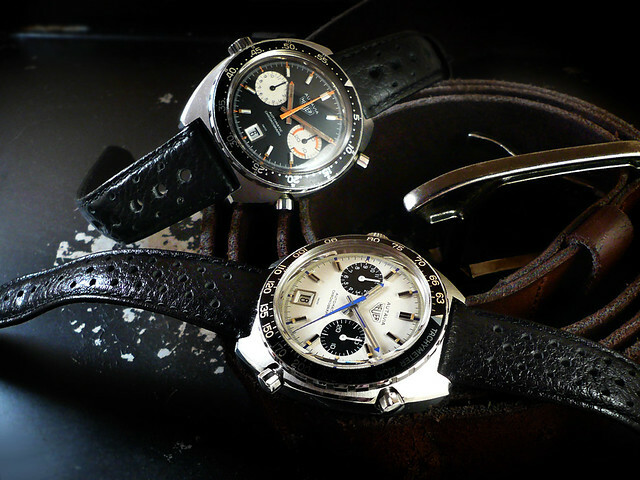 I have a choice of two NOS bezels too – Decomp or Min/Hour. 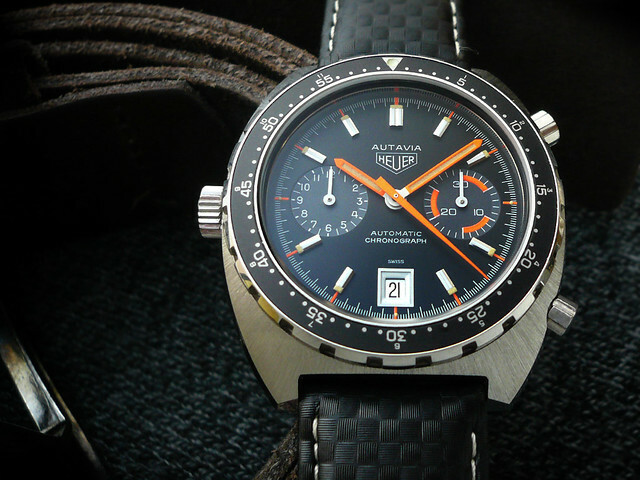 What I really like about this watch is the involvement of many people in the Heuer world that I have come to call friends.. 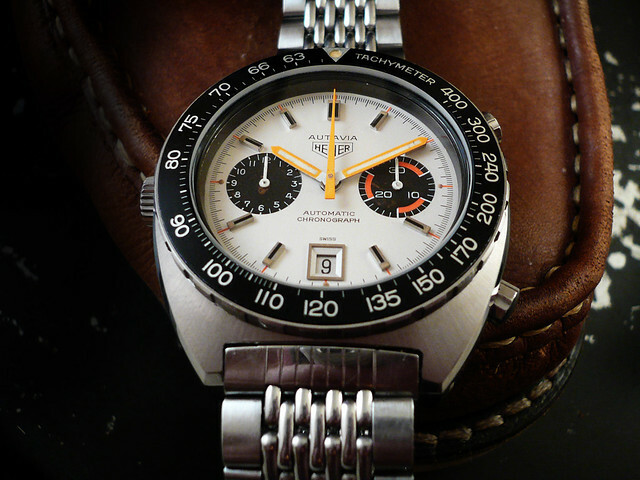 I was drawn in to the chromos by Pauls great site – Heuerworld, and learned a great deal from Jeff’s OTD, the original watch was from a US collector, the 11063 case sourced from Lanny in a trade for a bracelet I got from AndyO. The movement is freshly serviced by Rich Askham – one of the best in the business (who incidentally said that the movement was a dream, like new! 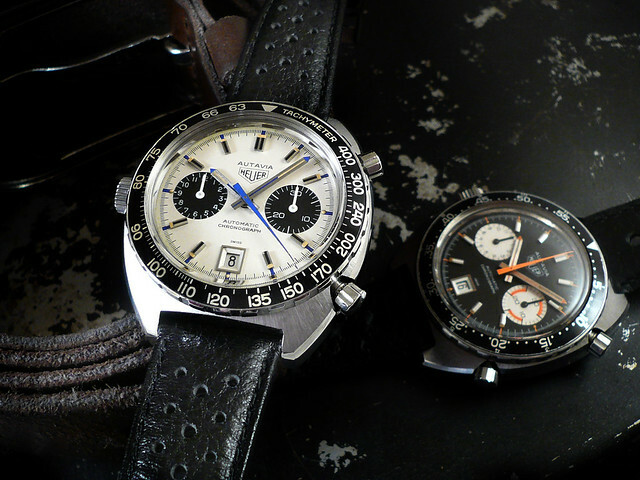 ), the M/H bezel is from RichC, the Decomp bezel is from AndyO via David D (fromCal.11.com), the case by Abel, at a slight discount in trade some help I gave him recently, and finally the putting together of it all by Jimbo.. it’s a celebration of some good Heuer friends, and purely for that, it’s a great thing to me, and I love it. It’s astonishing how time flies.. back in August 2012 a three way trade with two fellow Heuristas resulted in me saying goodbye to my 1163 Viceroy, and welcoming in this 11630P. That’s its official name, I added ‘decomp’ to highlight the decompression bezel, although it was only available with this bezel. This particular c1974 example has obviously seen quite a bit of sun, and the dial has turned a stunning tobacco brown ‘tropic’ colour, and there is some fading to the orange accents on the minute subdial. It’s quite wonderful. I tried to capture it in the photos, to little success I’m afraid, although the ‘dial shot’ does give a hint, it clearly noticeable in daylight. Under artificial lights, it does have a deep grey appearance too. 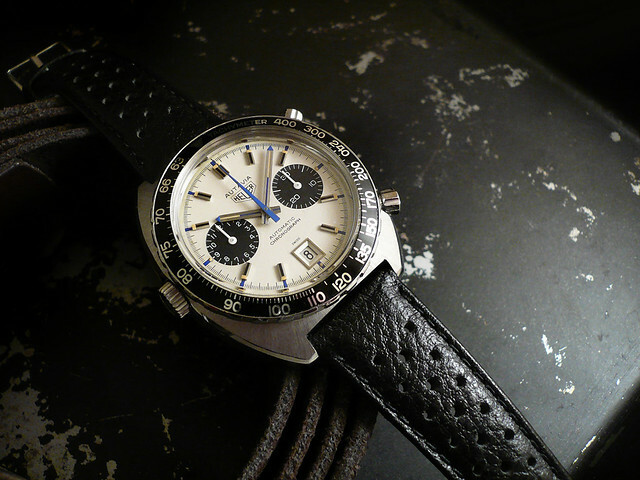 Also noticeable are the amazing ‘blued’ subdial hands. I haven’t checked all my Autavias, but I’n pretty sure those with white subdials have these blued hands, although they generally look black. Maybe the sun-bleaching has made them more noticeable in this case. 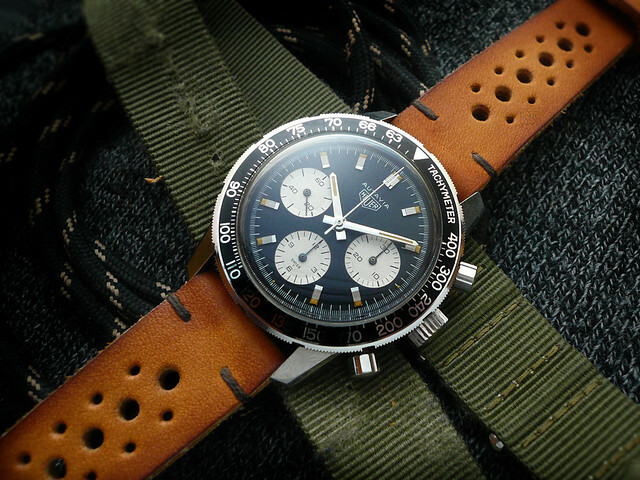 I don’t normally go for modern rubber straps on Autavias, but this ‘Breitling Pro Racer’ style seems to suit this special Autavia down to the ground. 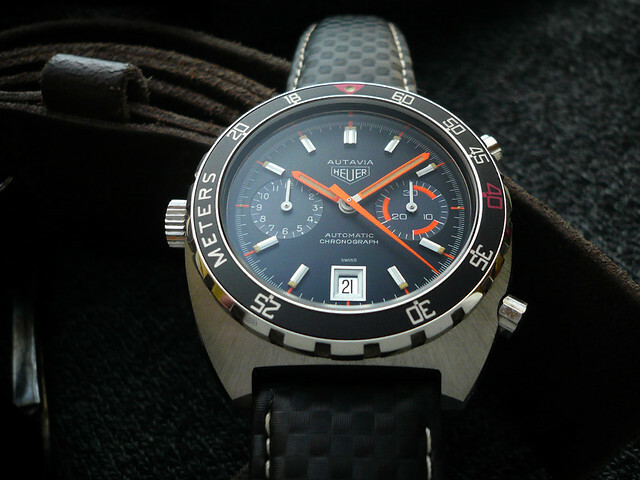 This is a truly special watch, and belongs to an elite group of Autavias that has directly applied hour lume plots, like you see on most of the GMTs, it gives it a real tool-esk appearance. 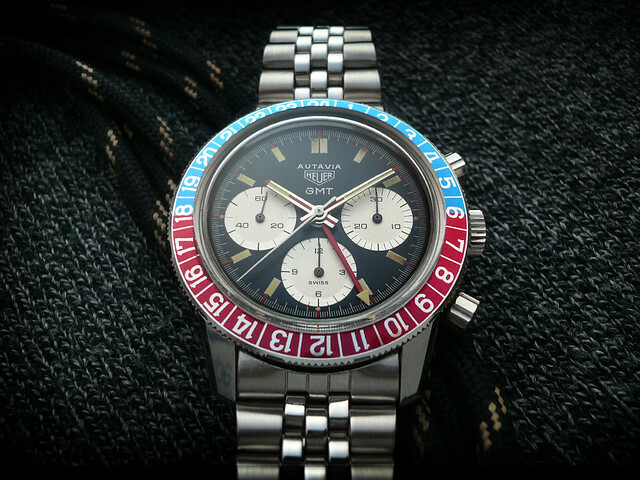 So, if you want the GMT look without the added hands and red/blue bezel, this is a winner. 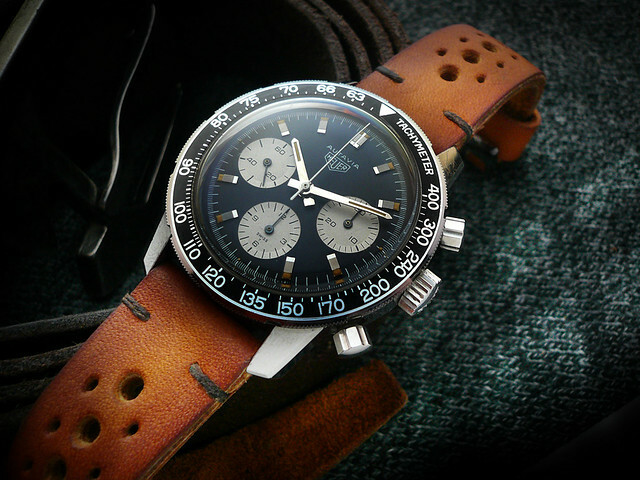 This example also had the pleasure to feature in the Autavia book (grab a copy – it’s highly recommended and makes a great coffee table book – with amazing photography). 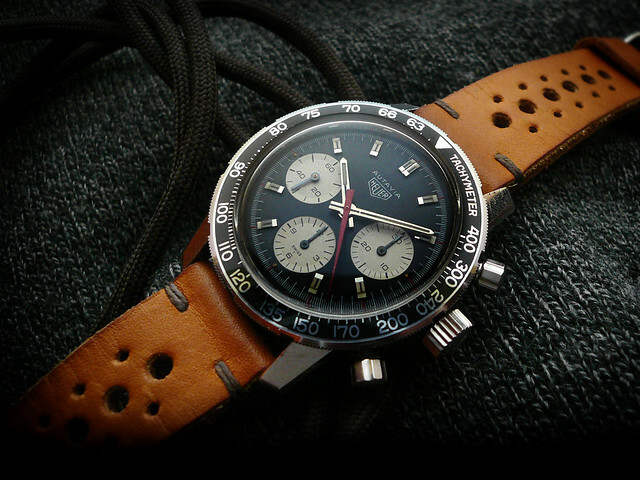 Simple really.. like many of Heuers models, they used French descriptions, ie. N = Noir (Black). P simply means Plongeur, or Diver – probably where ‘plunge’ originated! 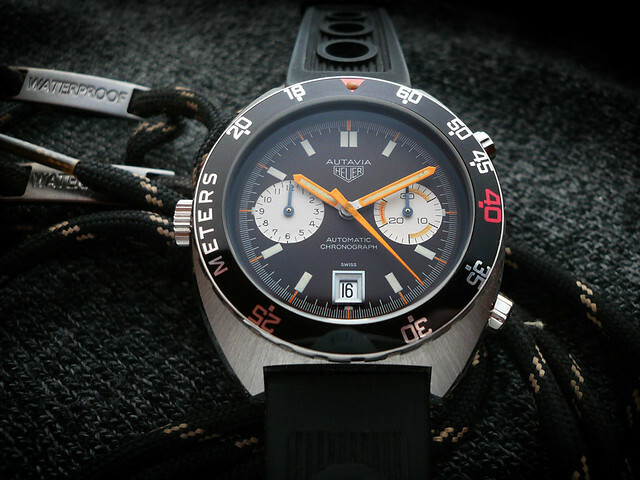 Oddly, the P coding was never used prior to this model, even for the Heuer divers, but it serves as a way to distinguish it from other 11630’s in catalogue listings and other official paperwork. 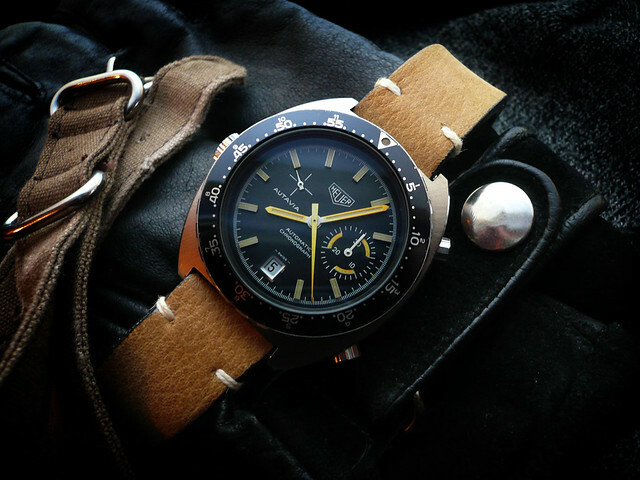 As this shares the same case with other 11630 models, there is nothing special ‘specification wise’ that makes it more suited to diving than any other 11630.. or any of the cushion case Autavias.. but I feel that I still need to file it under the ‘Heuer Divers’ category. Is it rare.. well, that’s subjective. I won’t hazard a guess at how many are out there, but it certainly isn’t common, and many tend to have seen a hard life.. all I’ll say is.. if you see a good one, buy it. 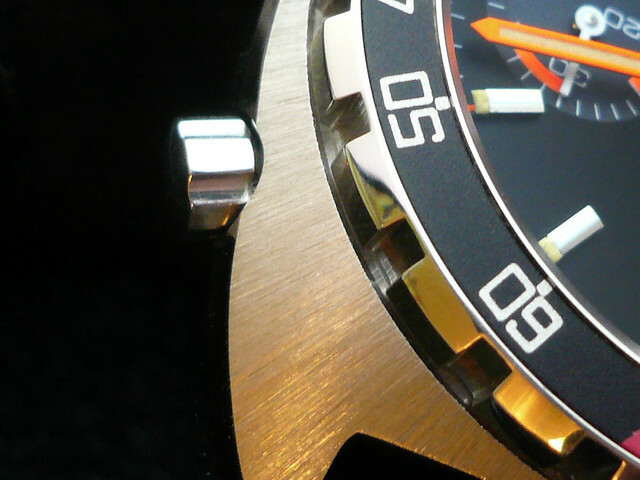 How does the decomp bezel work? Well.. I’m writing this from memory, so hope this is correct… as I understand it, it shows how long you have before you have to decompress..
You turn the bezel so the 12 o’clock triangle lines up with the minute hand, like any regular divers bezel. As you can see, you only have approx. 5 minutes at 60 meters depth.. but 9 minutes at 50m, 15 minutes at 40m, etc etc.. the last marking is right around the bezel, so at 18m you have 56 minutes to dive. Please let me know if that’s wrong! 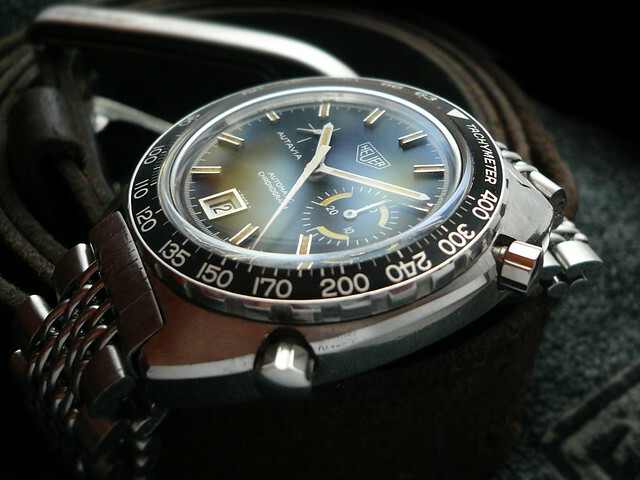 It is first seen in the 1972 catalogue.. clearly listed as 11630P Diver, but if you look closely, you’ll note that it if housed in an earlier 1163 case, with acrylic crystal, also it has no bezel lume pip. It was presumed that this might be an ‘art dept’ error, as these have been seen before – a pre-computer version of a ‘photoshop fail’. 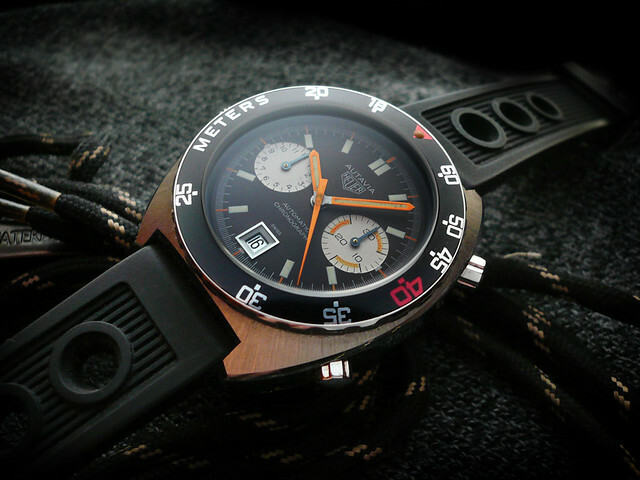 But in the last few years, 1163’s have surfaced which have this 11630P style dial. Some have decomp bezels, some don’t. Best guess is that it was a very short-lived run, and they switched quickly to the 11630 case. 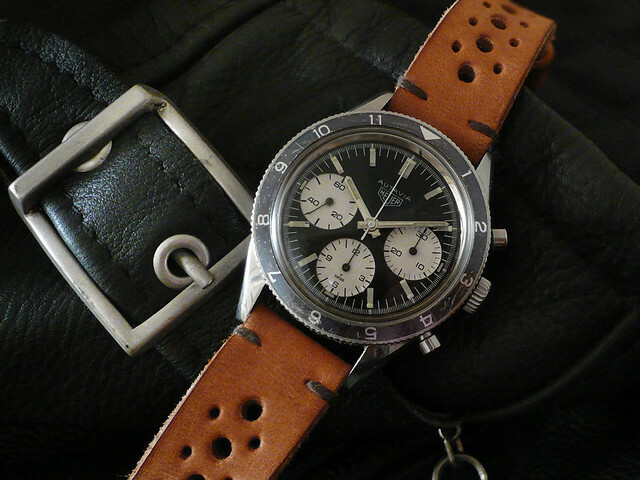 Here is an example that a fellow Heuerista acquired, being discussed over on the Heuer forum – as you can see, it too has a tropical brown dial. 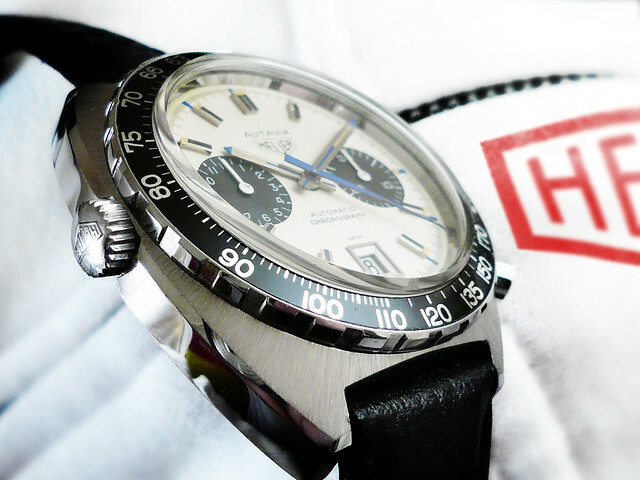 The next time it is seen (in available catalogues), is in the 1974 catalogue.. and this is the only time it is pictured with a bezel lume pip. That’s why I’m suggesting this one is from c1974, as opposed to later, although it’s possible the insert was replaced at service – these details are unknown. 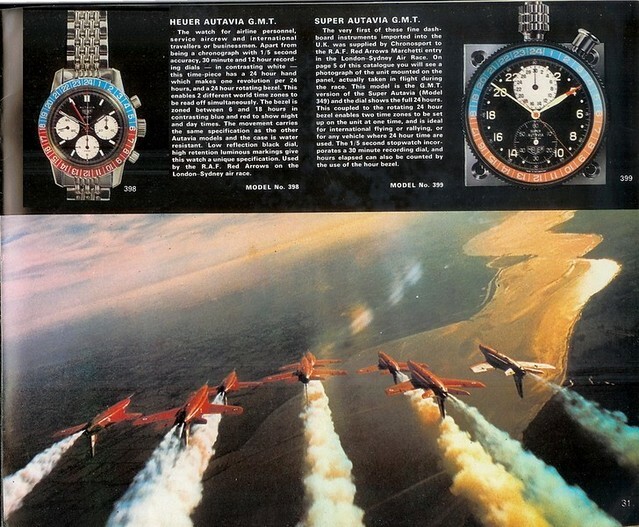 You can also see it in the 1978 catalogue, and it makes a cameo appearance on the wrist of a diver in the 1984/5 catalogue. I know it’s hardly visible, but I have a copy of the catalogue, and it is more clear in the flesh, see last photo below. 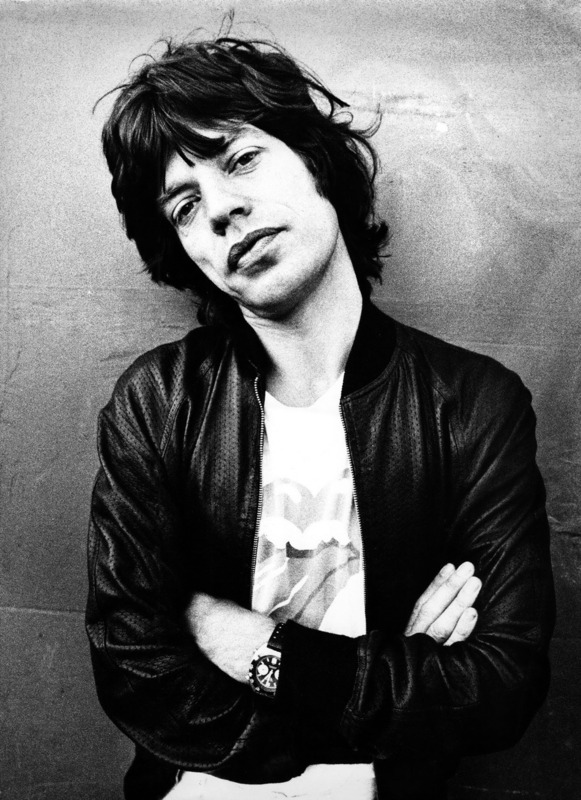 Also, it’s worth noting that one of the coolest dudes on Earth wore a 11630P.. Sir Mick Jagger. 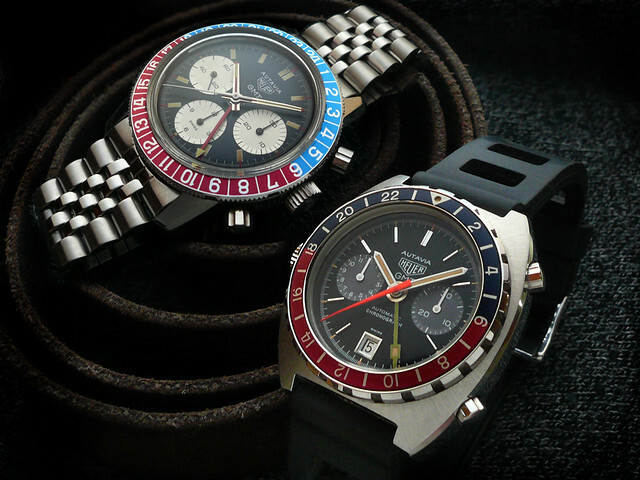 In fact, you might call him a ‘Heuer Guy’, as he also owned/owns a 70’s Carrera… more info here on OTD.. Jagger’s Heuers. There is a great write-up over on Cal 11.. Historic prices from OTD.. ’72 = $275, ’74 = DM620, ’78 = $439, ‘85 = 1,050DM. 1972 Catalogue.. 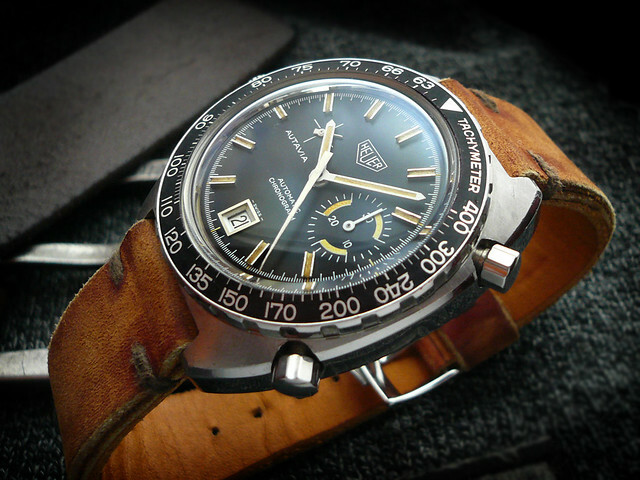 But is the 1163 cased variant..
1974 Catalogue… First time seen in 11630 form in available catalogues.. and the only time seen with a lume pip on the bezel. 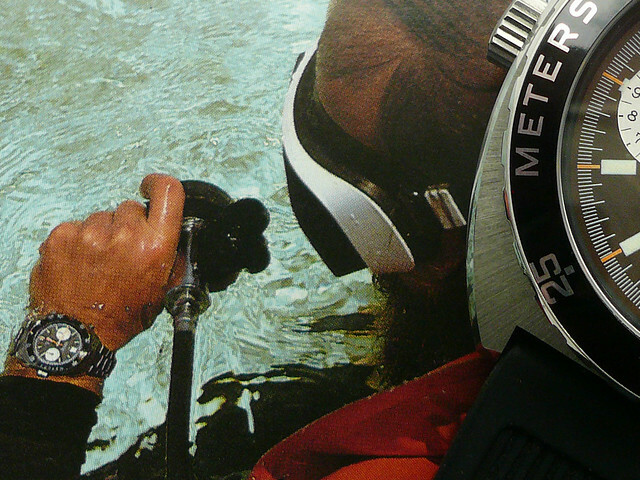 Not technically ‘shown’ in the catalogue, but the photograph of the diver in the water is wearing one..
All watch collectors will know that you don’t really get to choose which watches become firm favourites. 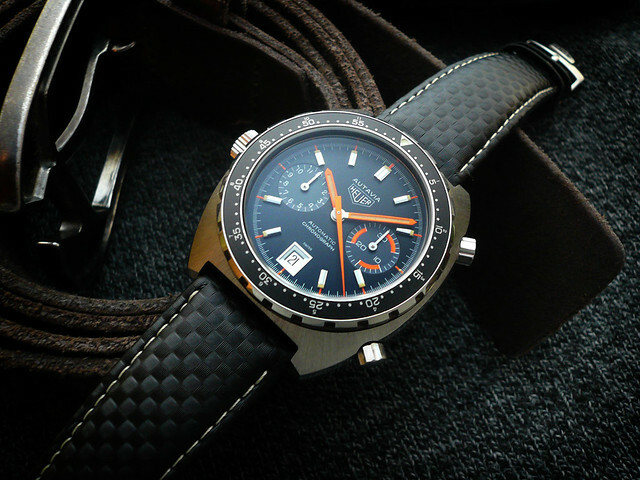 Sure, there are the ‘grail models’ that we chase, but every now and then we might take a punt on a watch, simply because it’s in decent condition and it’s fairly good value.. but surprisingly become rather attached to it. This Cal. 15 is such a watch. It was knocking about eBay for ages.. hanging around in my ‘watched items’ list, but I really wasn’t bothered by it.. it just sat there, being re-listed several times as seemingly, no one wanted it. I can’t remember exactly why I finally bid on it.. probably beer was involved. My bid won and it winged its way from sunny Greece to my door. I was pleasantly surprised by its fine original condition. 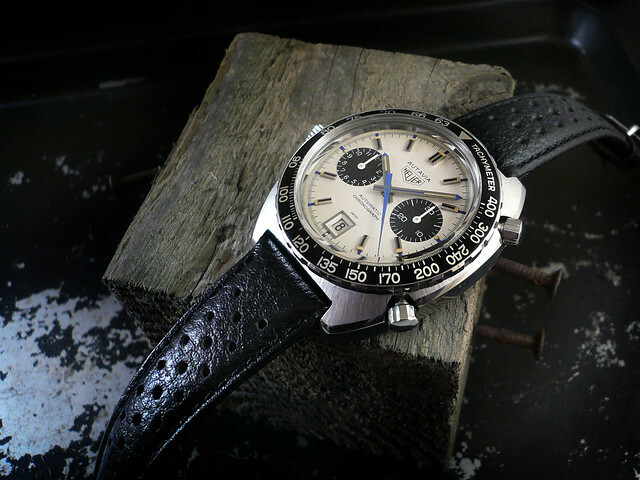 The most striking feature is its wonderful Hellenic sun bleached hands and dial. 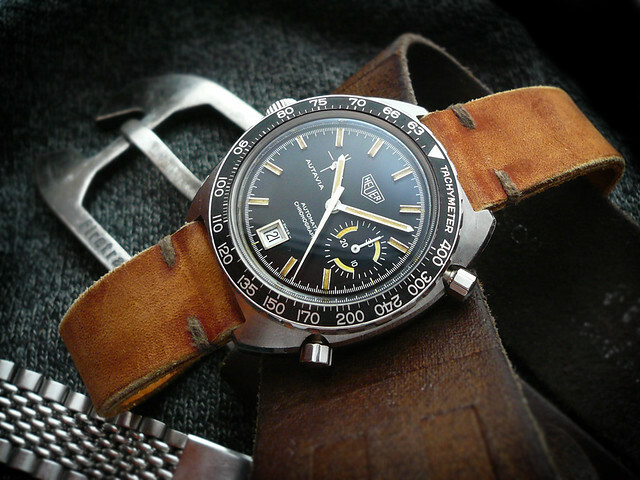 The original orange hands and dial accents have faded to a beautiful textured yellow.. the hands are especially nice, as they have faded more towards their bases – which may seem weird, but if you think about it, the tips spend more time in the shade of the watch case than the base – but that’s just a (terrible) theory. Either way, it has a lovely sun-bleached look.. 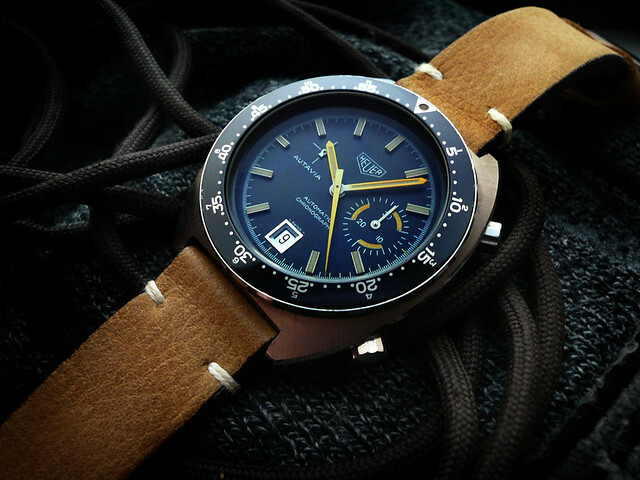 I guess the watch-nut term would be ‘tropic’, but that really is more of a ‘black to brown’ dial term.. so I like ‘Hellenic’, given its time basking in the Greek sun, it seems rather appropriate. The next problem was finding a strap for it.. it just didn’t look right on anything I had.. until I stuck it on an old DB10 strap.. and wow, what a combo. 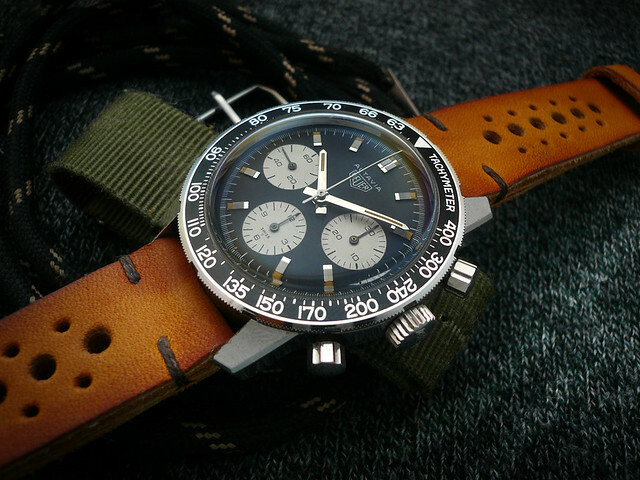 I know straps are personal taste, but if ever a strap & watch match was made in heaven, this is it! Thinking about it – maybe I should try it on a GF too. 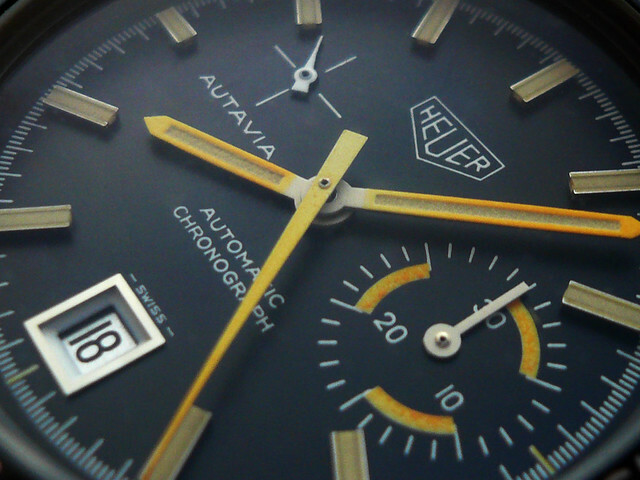 Some of the most sought after Heuers are the early screwback Autavias, and they are indeed very special. This iteration is what replaced the screwback cased models.. it is a compression snapback case, hence the ‘C’ in the model code. These are bigger and chunkier than it’s processors. Some prefer the more elegant case of the screwback, but I’m certainly a fan of this bold angular C case. They are awkward to capture in a photograph, but in the flesh, they are lovely.. and big for a vintage watch of the early 70’s. Lugs went up by 1mm to 20mm, the bezel dominates the top down view and is a touch under 41mm across, with the bigger fatter crown it comes in at 44.8mm. This is the last iteration of the C case, and features fluted pushers, ‘tramline’ applied hour batons, inlaid with a thin black stripe – as are the hands. 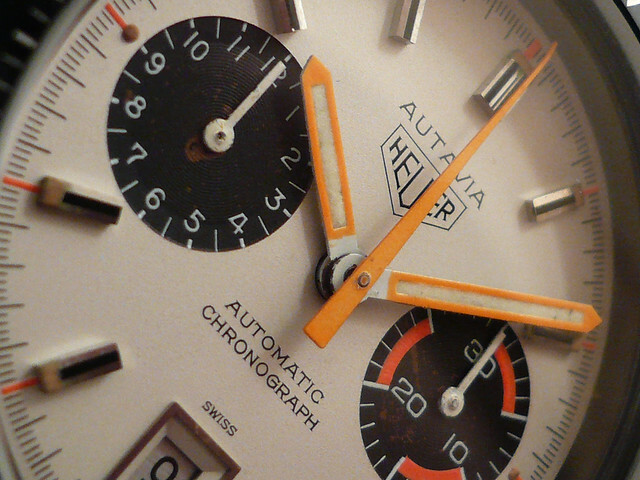 The outer track also has red highlights on every hour and features the red straight sided arrow chrono sweep hand that found it’s way onto the majority of all Heuers that came after. It also has fatter sub-dial hands, and of course, powered by the legendary Valjoux 72 movement. 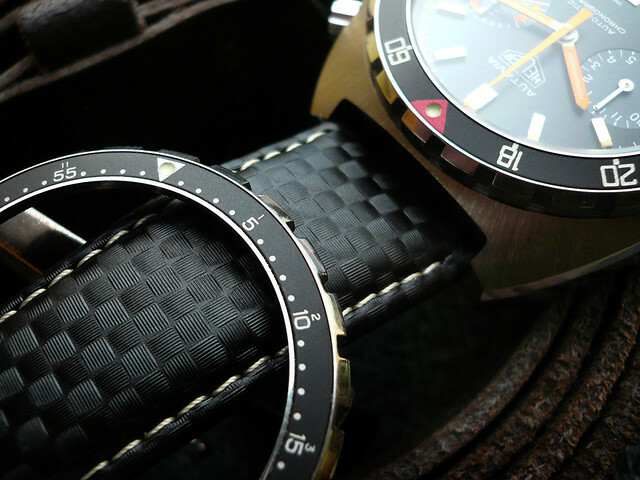 You can clearly see the black/red/fluted pushers DNA in this watch providing the ‘link’ between the early models and the later cushion case Viceroy colour scheme that we are all familiar with. 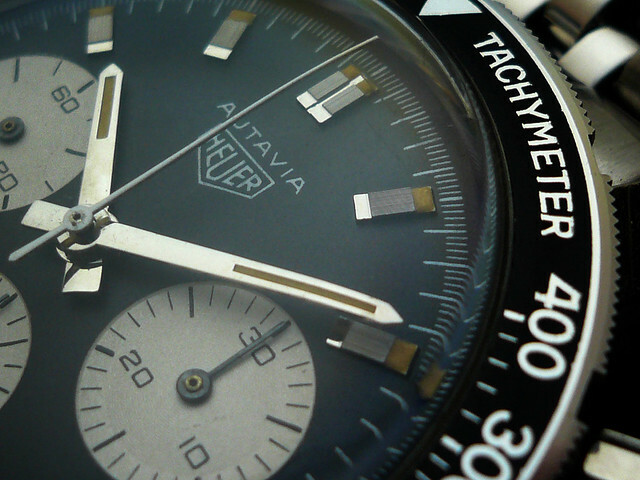 The exact ‘Mk’ of this model is a little confusing, as it was originally graded from the very first Autavias, which makes this (at time of writing) a 2446C – Mk5 dial, Mk5 hands.. but there are tiny iterations of other models that have been discovered, which pushes up the ‘Mk’ number. The latest thinking has made things more simple.. instead of working out which elements are which compared to the entire range, we just look at it from the point of view of the 2446 C case range.. and there were x2 dials, this being the 2nd. 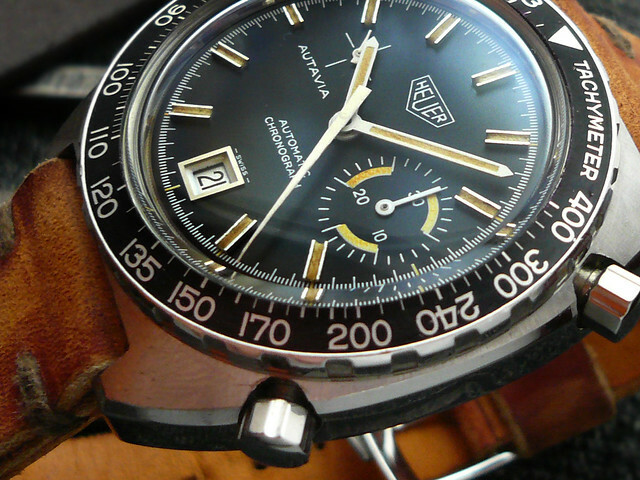 It is also far simpler to say that this is the last C case Autavia made. 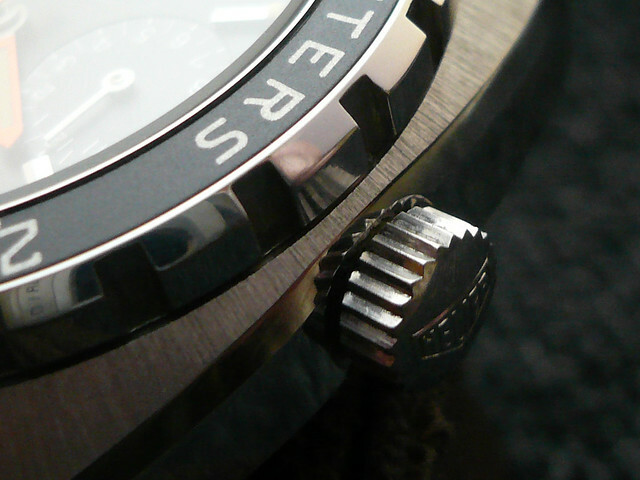 It also has a plain polished caseback, with the small concentric circles on the edge to mark where you open the case. 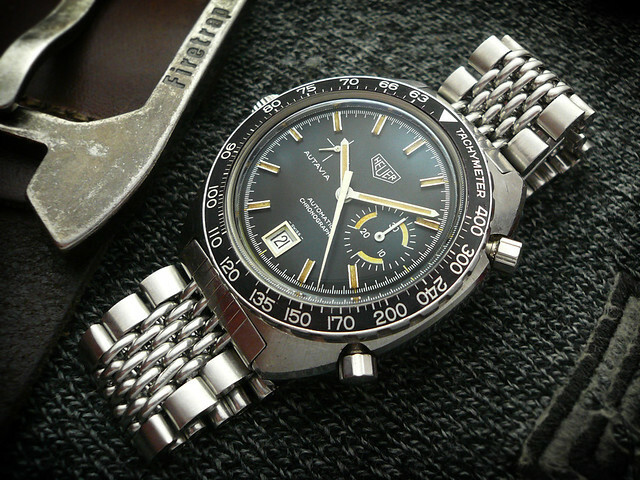 It’s bold design gives it a tool-like appearance, and as such is one of the few vintage Heuers that looks great on a NATO type strap. I know many don’t like them, but if you’re a fan, it does look great.. I tried some different colours, and they suit it well too. I was lucky enough to source a NOS bezel for this model, and it really sets it off. In fact, the Argentinian Airforce opted for this model for issued equipment. Here is an excerpt from an issued model that sold at Bonhams a while back.. I really do have a soft spot for the early Autavias, especially the v72 driven 2446’s, and this model is one of my favourites. Sure, the very early versions, especially the 1st Gen are beautiful, but they really are like hens teeth, and have a price tag to match. Figuring out which exact generation is which isn’t that easy these days, as subtle differences have been found and this expands the generation line. A lot of work has been done recently by Rich Crosthwaite and Paul Gavin whilst researching their new book on the Autavia. (Buy it here). The upshot is that some of the generations have minor differences in them, but still remain under the banner of one Mark. So, as an example there are 2 types of ‘Mk1’ (different hands) and so on. 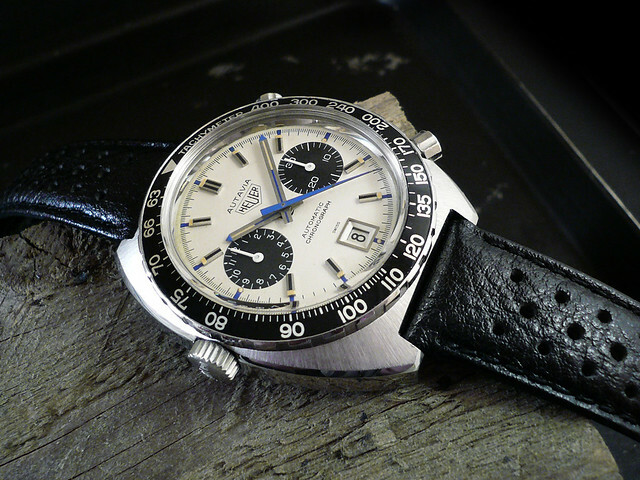 As there is no ‘governing body’ on these matters, it’s actually all down to individual collectors own thoughts, but the majority would call this model the 3rd Gen. (3rd execution dial, 3rd execution hands, screw back case from 1968/9). This one has an Hour bezel, the most aesthetically pleasing in my mind, but it was also available in Minute and Tachy bezel formats. 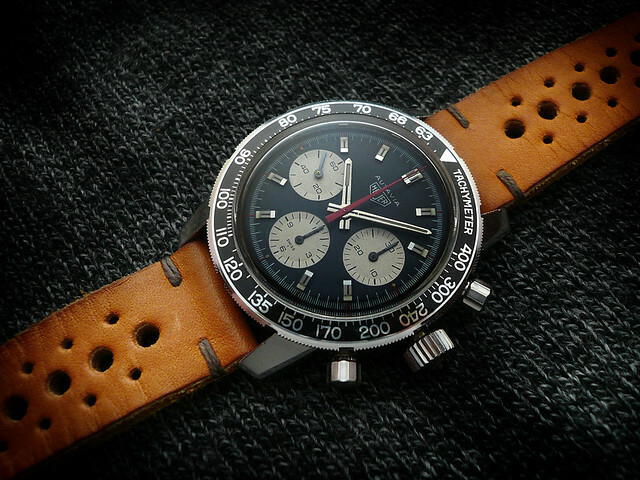 It’s more commonly known as the Rindt, as Jochen Rindt, the famous race driver wore this model (with minute bezel). Even this throws up some confusion, as some collectors loosely refer to any screw back model as a Rindt, which is technically incorrect. The screwback generations are overall smaller in case size than the later compression cases, with an unusual 19mm lug too. They are rather beautiful, but oddly, they are quite difficult to capture properly in photos, it’s difficult to show their true essence. 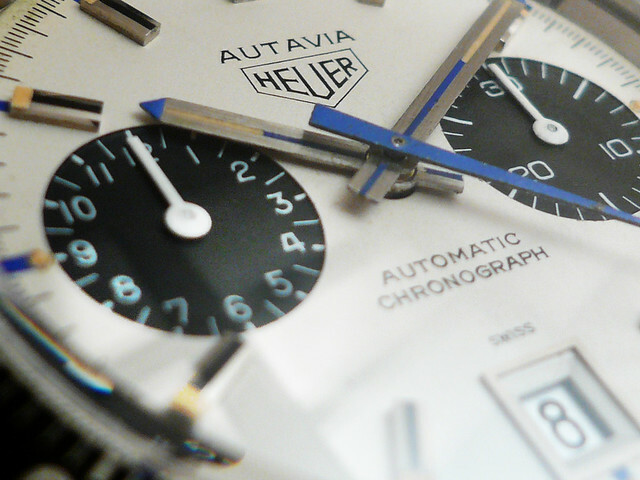 It sounds strange, but it’s a fine watch to actually handle – the sweeping elegant case lines, the superdome acrylic crystal, it has a warm feeling, if that makes sense, a true vintage piece with all the Autavia heritage connected to it. It really is special. I get asked this a lot – it’s one I have hand made, I will be selling them soon, but haven’t yet set up a shop or anything. I’m advising people to follow me on Twitter, and I will publish updates direct to your phone when they are available. 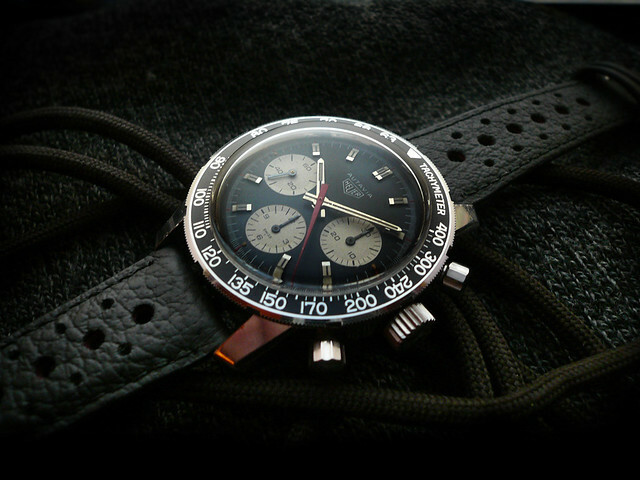 More info & Photos of Jochen Rindt & his watch here on fellow a Heuer enthusiasts excellent site..
Jochen’s wife, Nina, has a fascinating FB page, where she posts great old photos – well worth a visit..
Well.. what can I say.. this really is something special. 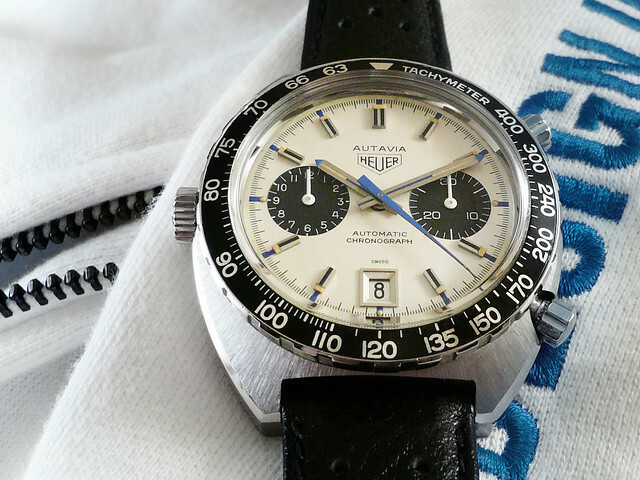 This is a rarity, the consensus amongst Heuer collectors is that there are known to be three 1163 white dials and five 11630 white dials known to collectors, so this would be the 6th. Known by various names, ‘Bianco’, ‘Great White’, whichever takes your fancy, it’s certainly a stunner. The dial isn’t flat white, it’s similar to the finish on the Siffert dial, in that it’s slightly metallic, well more of a pearl finish. But, side by side with a Siffert, is is a warm white, whereas the Siffert is a cool white – same way as you can set your monitor to warm or cool. 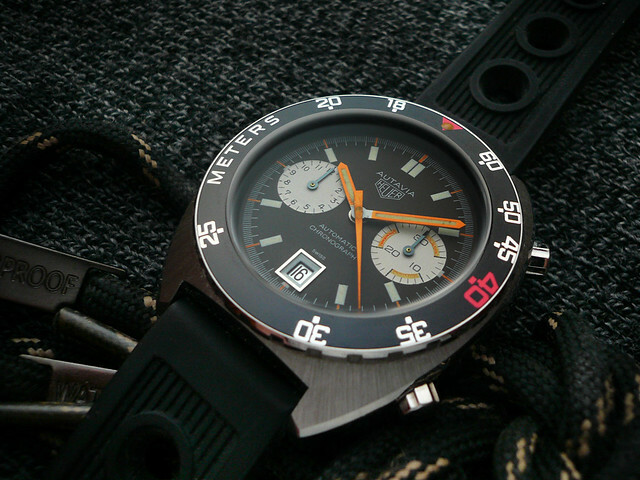 I’m certain this is intentional, and demonstrates the fine attention to detail that Heuer gave to it’s dial designs. 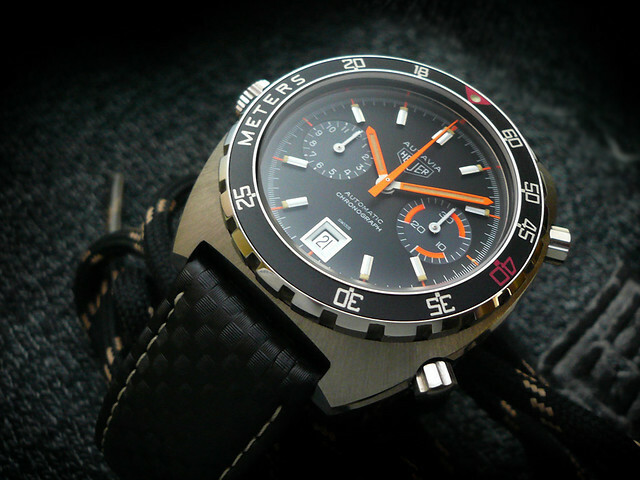 I noted this a while back with my 1163 Orange Boy, and Orange dial Diver – the lume is warm-white, or a pale peach, same on this dial too. It’s actually very clever. The Sifferts cool-white dial finish matches perfectly with it’s blue accents. 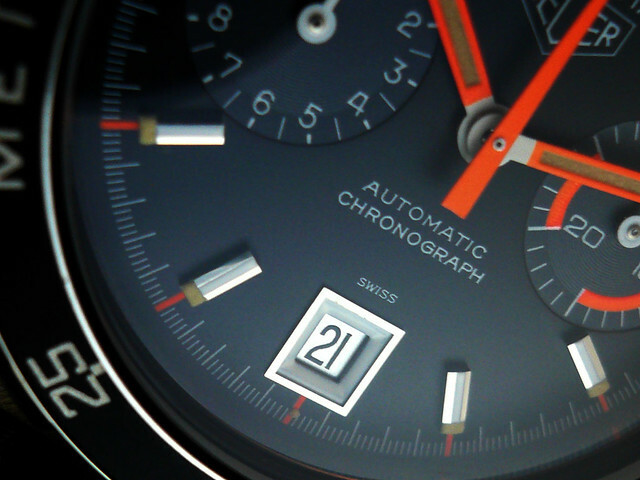 This ‘Bianco’ with it’s warm-white dial matches the orange accents. Another area to note is the subdials, you can see them losing their black colour and going tropical. It’s noted that the other white dials all have a degree of tropical discolouration or fading on them. 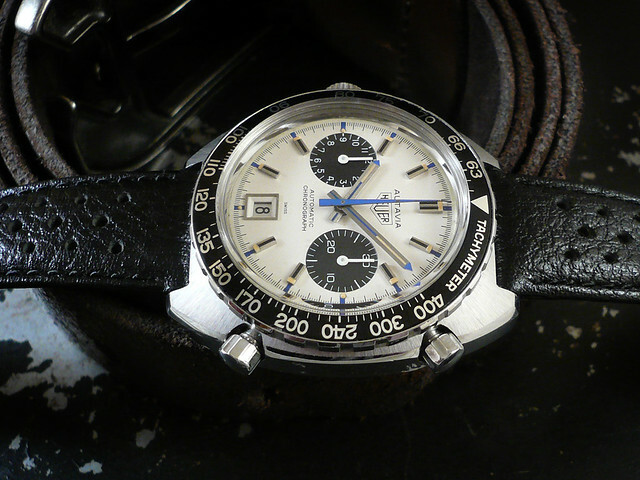 One collector even has a panda white dial Rolex Daytona Cosmograph from the same period, and made by the same dial company – Singer – and this too has completely faded tropical sub dials. This isn’t actually a totally original watch, it was once a black & orange dial, but I was very lucky to acquire the white dial separately. I could have put it in a 1163 case, but this would require an Orange Boy handset, which is just as rare as the dial itself. I decided to go for the 11630 case, as it’s my favourite and was a simple dial swap. A NOS tachy insert was sourced, a correct black glass gasket was hunted down, and here it is, in all its wonderful Bianco glory. The hour and minute hands are slightly broader than a regular 11630, I believe them to be early service hands. They actually look better on the white white, giving better eligibility. For more insight, the ‘white dialers’ were recently discussed over on OTD here. 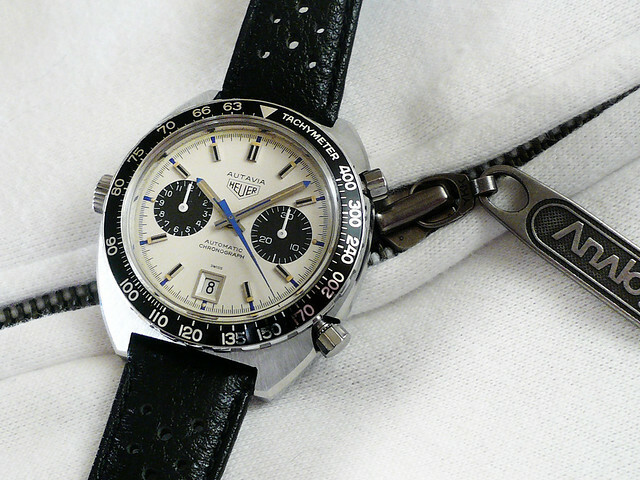 A big thanks goes to fellow Heuer collector and master Heuer tinterer James for letting me try out his Siffert. Thanks bud. So, this is a 1971 Mk4 version with a Cal. 11 movement. At some time in it’s life it has most probably had the dial and hands replaced at service, so it has the later Mk6 dial, with the 1-12 numerals on the hour counter. This Mk6 livery is actually one of my favourite Sifferts, I love the blue tipped hands and tramline hour batons. (Earlier models had ridged batons). 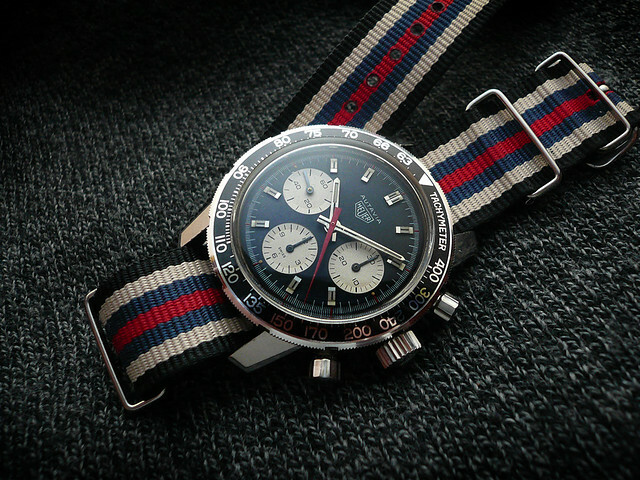 This is actually the first Siffert I have ever handled or seen in the flesh, and I’m genuinely blown away by it. 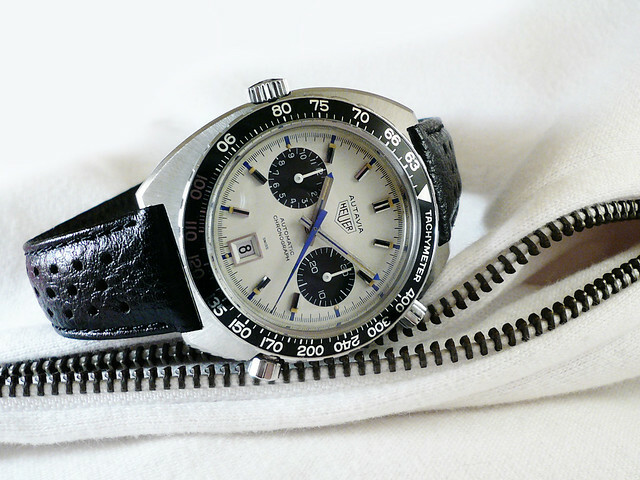 Up until this point I had always admired the Siffert, but was of the mindset that it was a little overpriced compared to its other Autavia brothers. 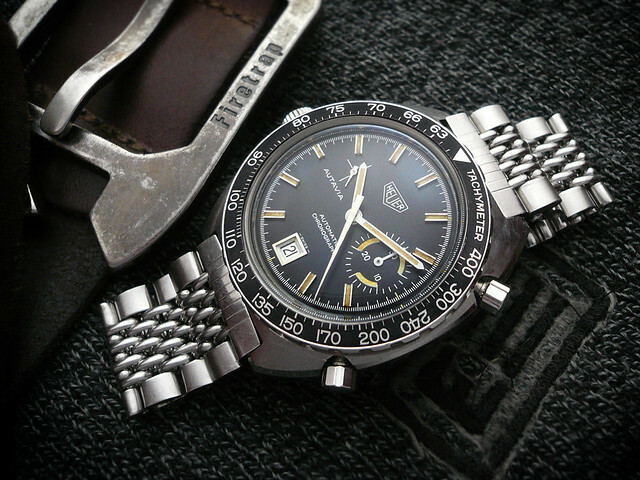 Now I can see the appeal, and why they command top prices – it is strikingly beautiful, and I can see why it is firmly one of the most sought after Heuers. 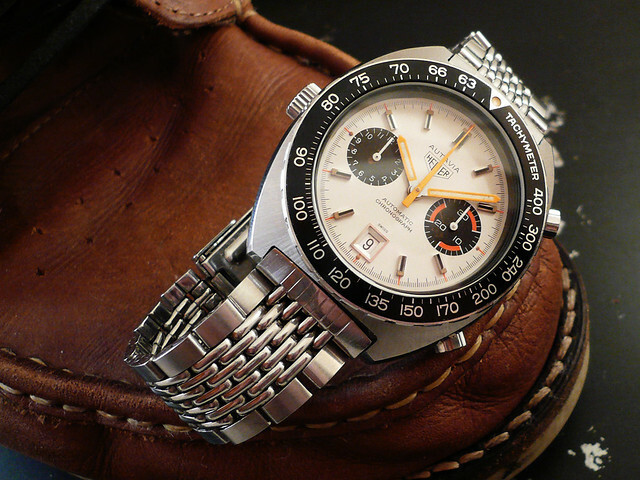 I won’t go into too much detail about Jo Siffert, but to simply say he was a legendary Swiss racing driver who loved his Heuers, and wore a white dialed 1163T for a long time. If you want to read up on his illustrious career, check out the Siffert Wiki page here. 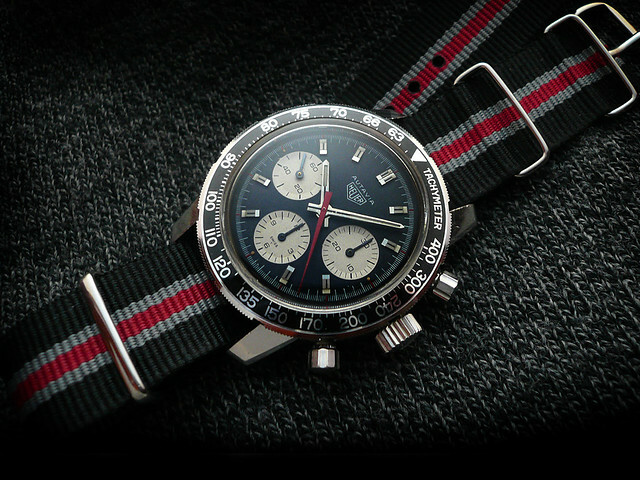 For some more reading and great photos of Jo Siffert, check out fellow Italian Heuer collector GMV’s blog here.